Seulgidoong are undisputed representatives and performers of Korean traditional music in new pioneering spirit. They were founded in 1985 by 9 members from the Traditional Music Orchestra of Korea Broadcasting Systems. 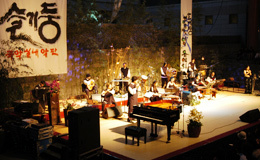 Since then, with their exceptional performing skills and unique musical sensibility, They has been providing traditional Korean music with contemporary sentiments and manifesting a new musical world through peculiar repertoire developments.